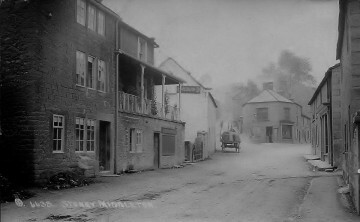 A rare view from The Avenue (Main Road) looking towards the High Street with the butches and Corn Cross in the centre. The cottages to the left have long since gone as to the stables (by the cart) which at first glance looks like The Moon Inn, especially with the sign on the wall. The building was actually the stables which housed the horses for the evening when the pub served as a Coaching Inn. What a great picture! So fun to see these pictures now and recognize where they are, even if some of the buildings are gone. Stoney Middleton and its inhabitants hold a very special place in our heart.